Four years after six specimens were discovered in Argentina, scientists have finally given a name to what is now considered the largest animal to ever have walked the Earth. Say hello to Patagotitan mayorum—a Cretaceous-era dinosaur that weighed an astonishing 152,000 pounds. Before we get into the details of the new study, published today in the Royal Society B, let’s just quickly go over how impossibly big this titanosaur actually was. The average weight of these behemoths was 76 tons, or 152,000 pounds, which is nearly the weight of the Space Shuttle, or 10 African elephants. A typical Patagotitan mayorum measured about 112 feet long (37 meters), which is 70 percent the width of a football field. The top of its shoulder reached 20 feet high (6 meters), or about four humans stacked on top of each other’s shoulders. The researchers came up with these numbers after analyzing six specimens, and more than 160 individual fossils, all of which were found in the same quarry. 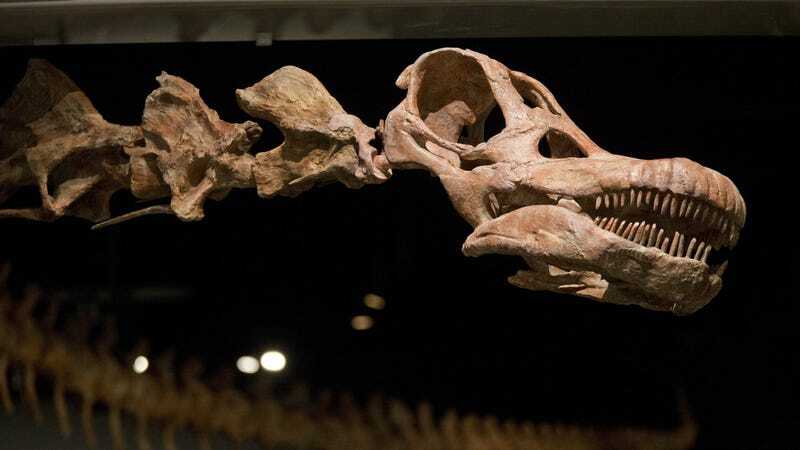 The newly described dinosaur was named after the Patagonian region in which the bones were uncovered, the Greek word titan (no translation required), and Mayo, which is the name of the family that hosted the researchers during the excavations. So these things were stupidly huge, and their existence is resetting our notions of just how big sauropod titanosaurs—a diverse and highly successful group of four-legged herbivorus dinosaurs— actually got. The discovery of Patagotitan mayorum [pronounced pata-go-titan may-or-oom] bumps another species of titanosaur, Argentinosaurus, to second place on the all-time biggest land animals list. Blue whales, which can weigh as much as 400,000 pounds, are still the largest animals known to have appeared on Earth—past or present. But unlike P. mayorum and other titanosaurs, blue whales don’t have to stand on four legs. Needless to say, however, these creatures were not swift of foot or fierce. They likely plodded around, searching for what must’ve been an endless supply of foliage. And indeed, the researchers who conducted the analysis, a team led by Diego Pol of the Egidio Feruglio paleontology museum in Argentina, ascribe this dinosaur’s enormity (or tendency towards “gigantism,” in their words) to the tremendous abundance of flowering plants that were available 100 million years ago. Interestingly, Pol suspects that P. mayorum was hitting a wall in terms of how large land animals could get. Correction: A previous version of this post compared the length of this dino to the length of a football field, when we meant width. Sorry for the error.